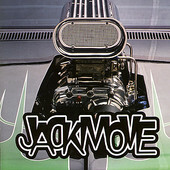 Aggressive, hard-hitting, and in-your-face rambunctious punk rock, Jackmove comes at you with all they got, quick, punchy, monstrous songs loaded with growling vocals, propulsive rhythms, and bone-crushing mayhem fueling wild times and wilder rides. This is fiery punk rock that won't, can't be stopped. From start to finish this is non-stop, straight to the point punk rock that wastes no time or words, going for the jugular and cutting deep. I'll give it a B-.